Camera drones are an easy way to get a bird's eye view without risking life and limb, and the Skeye Nano doesn't disappoint. This tiny drone streams every detail of the skies above to your smartphone via a crisp first-person camera, and it's now $30 in the TechnoBuffalo Deals Store. Did we mention it's easy to control? The 6-axis flight control system means the drone can spin in six different ways, allowing the user to manipulate flight paths like a pilot. And if you don't like the controller, switch to your smartphone! That's right, you can use your iPhone or Android device as a remote control thanks to onboard Wi-Fi. If recording soaring footage isn't your thing, just sit back and entertain your friends with aerial acrobatics – and even fly at night with built-in LED lights. Plus, when you want to land, rest assured the Skeye Nano will touch down easily with built-in auto functions allowing it do so with ease. 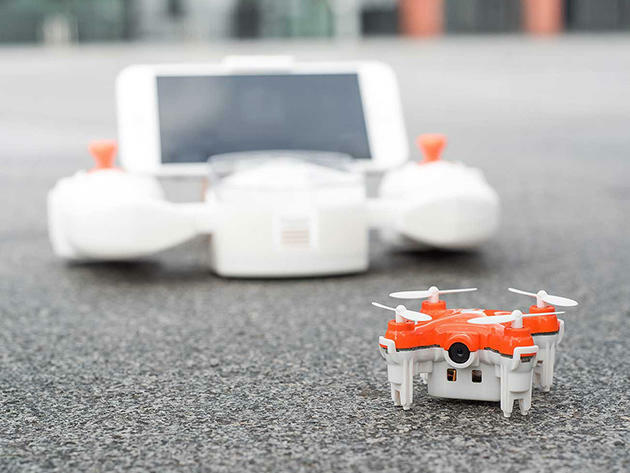 Supplies won't last: this mini drone is certain to be a holiday favorite. Grab it now for just $99, marked down from the regular $129 with free Continental U.S. shipping included in your order.